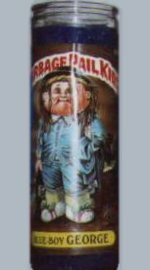 I put this section together, so collectors could see some of the unofficial and unusual Garbage Pail Kids items out there. Some of these items are high quality and are worth collecting, but there are plenty that are not. I also tried to provide rough estimates of what the items were worth. The values I listed are to be used as guides and can fluctuate significantly depending on collector interest and availability. Hopefully, this section will teach you to be careful about buying Garbage Pail Kids items and not listen to the lies and misinformation that is out there. Description: These items are metal, clasp pins called "Garage Pale Kidz". 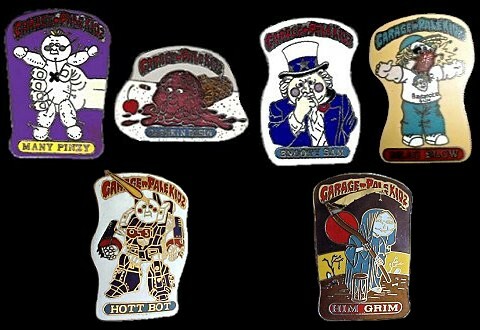 Using the name "Garage Pale Kids" instead of Garbage Pail Kids was probably to avoid licensing the product, but the pins are of copyrighted Garbage Pail Kids artwork. Each pin measures approximately 1-1/4" x 1-3/4". The pins have an enamel paint finish and are very good quality. The "Many Pinzy" pin on the top-left is of the United States Garbage Pail Kids 3rd Series character 85a Stuck Chuck / 85b Pinned Lynn. The "Bashkin Robin" pin second to the left on the top is of the United States Garbage Pail Kids 3rd Series character 101a Mushy Marsha / 101b Basking Robin. The "Snooty Sam" pin second to the right on the top is of the United States Garbage Pail Kids 3rd Series character 110a Snooty Sam / 110b U. S. Arnie. 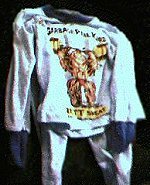 The "Beau Blow" pin on the top-right is of the United States Garbage Pail Kids 3rd Series character 84a Joe Blow / 84b Rod Wad. The "Hott Bot" pin on the bottom-left is of the United States Garbage Pail Kids 3rd Series character 87a Hot Head Harvey / 87b Roy Bot. The "Him Grim" pin on the bottom-right is of the United States Garbage Pail Kids 3rd Series character 95a Grim Jim / 95b Beth Death. Description: These items are from an Argentina trading card release called "Basuritas del Cuerpo". There were Garbage Pail Kids releases from Argentina with the Basuritas title, but Basuritas del Cuerpo does not have anything to do with Garbage Pail Kids. Sample images of the unopened packs, cover of the sticker album, and pages from the sticker album are shown above. In Argentina, the items are not called trading cards. Instead, they are called "figuritas" or "cromos", which are items that were meant to be glued into sticker albums. 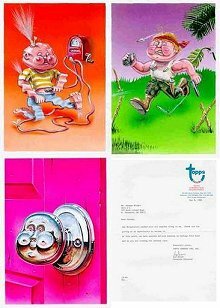 Description: These items are Garbage Pail Kids paintings that were submitted to Topps by a fan, but Topps rejected them. The rejection letter is shown in the bottom right corner. Description: These items are ashtrays with homemade Garbage Pail Kids stickers stuck on them. The seller of the items had mentioned that the ashtrays could also be used for pocket purses. Each ash tray measures 2-1/2" x 2-1/2". The artwork used for the stickers was squashed to fit into the square area on top of the ashtrays. Description: These items are Garbage Pail Kids 3-ring binders. The red binders and the blue binders have a white area for the Garbage Pail Kids banner, and the yellow binders do not have a white area for the Garbage Pail Kids banner. The binders were most likely all made by the same company. Description: These items are Garbage Pail Kids buttons. The top-left button is a bootleg from Japan. The bottom-left buttons are bootlegs from the United States, and some had artwork from Garbage Pail Kids card backs on them. The Garbage Pail Kids banner does not appear on some of the bootleg buttons. There were originally eighteen buttons on the sales card for the bootleg United States Garbage Pail Kids buttons. The buttons on the top-right and bottom-right were homemade. Description: This item is an ordinary jar candle with a homemade Garbage Pail Kids sticker stuck on it. 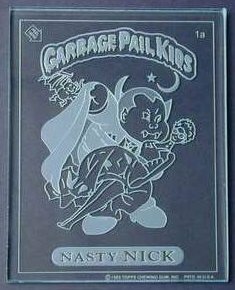 Description: This is a 4" x 5" engraved piece of glass with card number 1a, Nasty Nick, on it. The person that originally owned this item bought it at a state fair in Texas. It was meant to be displayed standing upright, and it came with a stand to set it on. A collector had researched this item and discovered it was sold by a company in Texas called Artistic Glass Designs, but the company no longer exists. Description: This item is a metal cigarette case with a homemade Garbage Pail Kids sticker stuck on it. 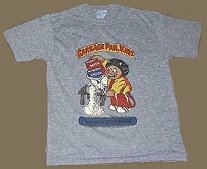 Description: These items are Garbage Pail Kids T-shirts and pajamas. The item on the top-left is a pair of Brett Sweat Garbage Pail Kids pajamas. The item on the top-center is a Cranky Frankie Garbage Pail Kids T-shirt. The item on the top-left is a Leaky Lindsay Garbage Pail Kids T-shirt. The item on the bottom-left is a Tattoo Lou T-shirt. The item on the bottom-right is a Bruised Lee Garbage Pail Kids T-shirt. The T-shirt on the bottom-right was homemade. The items on the top-left and top-center were licensed. It is not known if the items on the top-right and bottom left were bootleg or licensed. 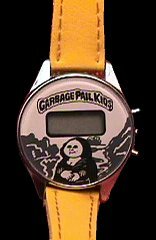 Description: This item is a digital wristwatch, and it has the United States Garbage Pail Kids 2nd Series character 67a Phony Lisa / 67b Mona Loser on it. These digital wristwatches are rare, and only a few of them have appeared for sale on the Internet. Description: This item is a Cabbage Patch Kids doll that was modified into a Garbage Pail Kids doll. The box was custom-designed. The doll was supposed to look like the United States Garbage Pail Kids 1st Series character 40a Unstitched Mitch / 40b Damaged Don. Please note that it is not legal to sell modified Cabbage Patch Kids dolls. 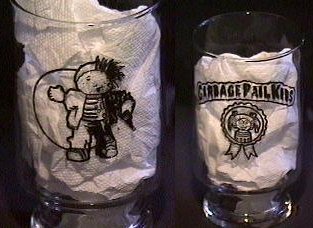 Description: This item is a drinking glass with the United States Garbage Pail Kids 2nd Series character 81a Split Kit / 81b Mixed-Up Mitch on it. The other side of the glass has a Garbage Pail Kids banner and an award tag on it. The award tag is from the United States Garbage Pail Kids 2nd Series card backs. The drinking glass measures about 7" tall and 3-3/4" wide. The person that took the pictures of the glass stuffed paper towels inside of it in order to make the design easier to see.